PanARMENIAN.Net - It gets quite chilly in the northwest region of Canada but the diamond industry in the area is starting to burn red hot as a 552-carat yellow diamond was discovered in October. 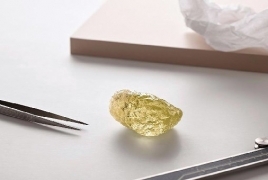 The rough diamond was unearthed at the Diavik Diamond Mine, approximately 135 miles south of the Arctic Circle in Canada’s Northwest Territories, jointly owned by mining companies Rio Tinto and Dominion Diamond Mines, which made the announcement Friday, December 14, Forbes says. It is the largest diamond discovery in North America, far surpassing the previous record held by the 187.7-carat “Diavik Foxfire,” which was recovered at the same mine in 2015.